Foodie consumers these days are more demanding than ever. Of course, they want something that tastes good, prepared in a sustainable way, and often with awareness of traceability and an understanding of the history or culture linked to brand. Increasingly, they also want the product to be healthy. 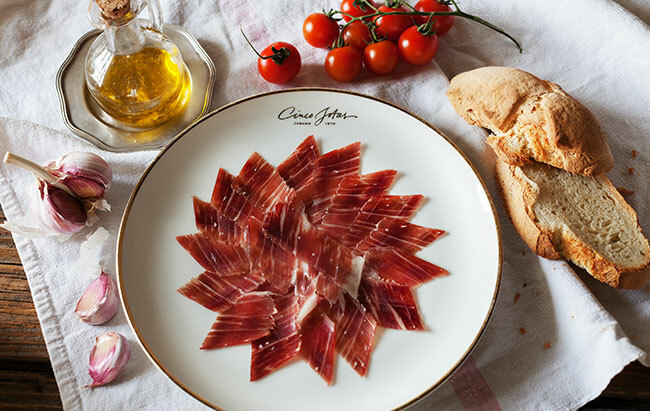 Cinco Jotas and its array of product lines, such as acorn-fed 100% ibérico shoulder ham, addresses these desires fully. Few foods can boast of achieving the culinary holy trinity: exceptional taste, health and sustainability. What makes our products so healthy? Ibérico ham is unique in that it provides a significant amount of protein, oleic acid, and an array of nutrients such as phosphorus, iron, zinc and critical vitamins such as B12 and B6. How does this translate into healthy practices in the kitchen? Cinco Jotas products are the very best ally of fresh, seasonal foods. With a range of both simple and sometimes more complex recipes, nutrition is always at the forefront. At Cinco Jotas we aim to simplify. That’s why we have created this balanced and varied menu that provides all the necessary nutrients while maximizing flavour. What’s more, each recipe follows the recommendations of the lauded Mediterranean Diet. Cut the watermelon and melon into 3x3 cm cubes. Quickly cook all six sides of the melon pieces in a pan. Sprinkle cardamom on the melon and fresh mint on the watermelon. 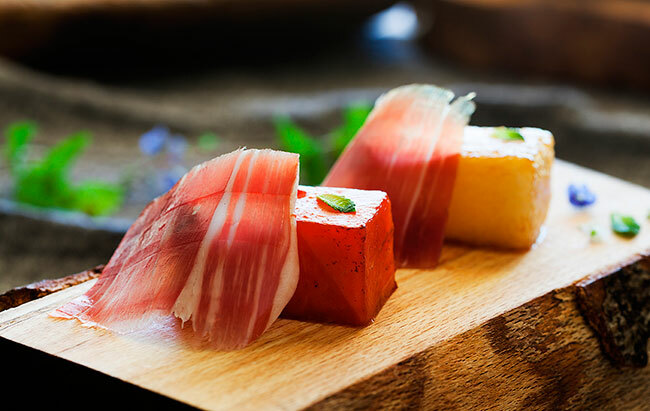 Place a slice of ham on each melon cube. Peel the orange with a vegetable peeler. Cut the strips into julienne, blanch them 3 times, and put aside. Blend the oranges. Using only 150 grams from the resulting liquid, emulsify with olive oil and xanthan and set aside. Peel the asparagus carefully and blanch in salt water for 2 minutes. Cut in halves and cool. 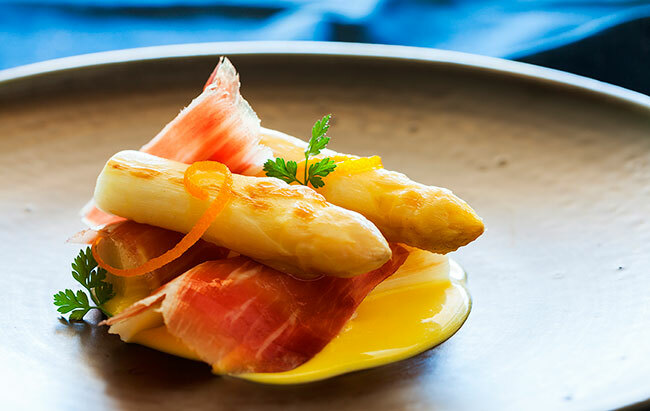 Quickly grill the asparagus and place them on the orange emulsion, scattering Cinco Jotas ham flakes in between. Finish with orange strips and chervil leaves. 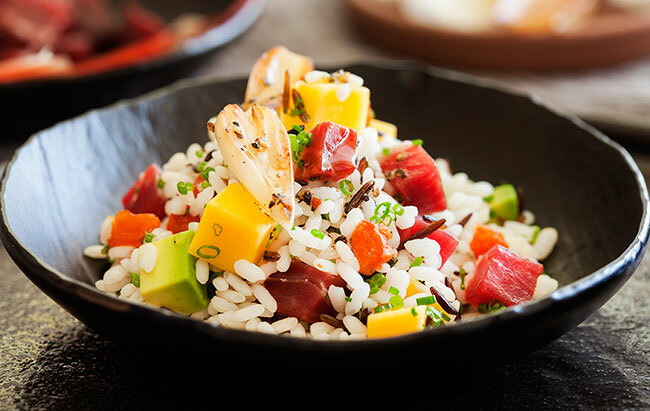 Sauté the ham fat in a wok or large skillet with the onion, rice, mango and cherry tomatoes. Remove from the pan and add the avocado, the Cinco Jotas ibérico ham cubes and the chives. Mix well. Stretch a thin layer of yogurt on an anti-stick sheet and allow to dehydrate at 60 ° C for two hours. Then set aside in an airtight place. Make the bath of alginate and water 12 hours before and set aside. When the 12 hours has passed, add yogurt to the alginate bath with a 5 ml spoon. Leave in for 1.5 minutes and then transfer to a water bath to cool. If you wish to maintain the spheres, place in a milk bath. Sauté the fruits, placing them into a pan from hardest to softest as they cook. 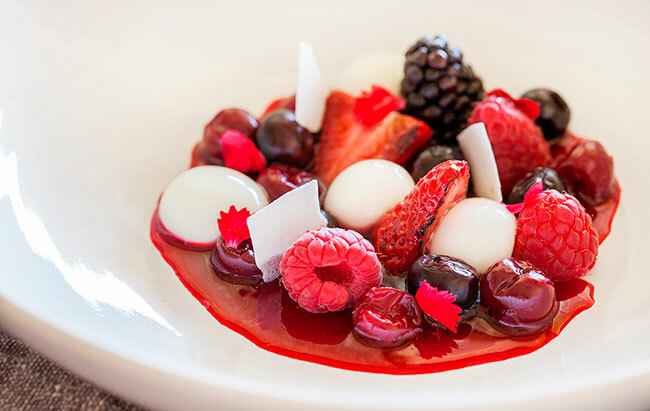 Display on a deep plate with the fruit interspersed with the yogurt spheres, yogurt crisps and carnation petals. Then, sprinkle with the currant juice.